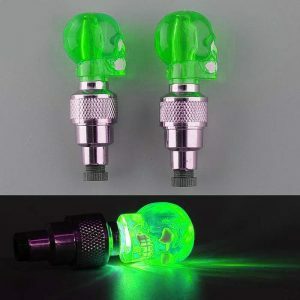 These Skull Tyre Valve LED Light fits most bicycles, motorcycles and car wheels. 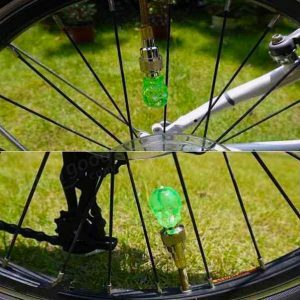 LED Bike Wheel Light features motion sensors, LEDs and replaceable batteries. Skull LED lights will turn on when the vehicle is moving and off when the vehicle comes to a stop. Screws onto the valve stem of your car, bicycle or motorcycle in seconds. Enhances safety by increasing visibility at night and during bad weather conditions. Easy to install and remove. 1 Unit of Green LED Flash Light Enhances safety by increasing visibility at night and during bad weather conditions More energy-efficient with light & motion sensors Durable, High Impact, Auto shining, No switch 100% waterproof. Skull design Wheel Valve Light can be used for car,motorcycle,bicycle,mountain bike etc. You just need to connect it to valve hole. 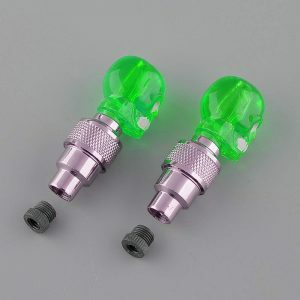 It can flash light as you tightening it,a great part for lighting and decoration at night. High quality, small, lightweight,long life. Small and exquisite appearance,it is convenient to carry. It can be installed on the air tap of tyre,it will flash when the wheel rolls. 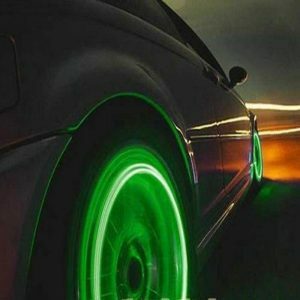 Make your favorite car,motorcycle or bicycle personalized and absorbing. Increases visibility of nighttime or bad weather for enhanced safety. Matched with three AG10 button cells each.